These two technologies represent the diminishing returns of investing in capital-augmenting technologies while labour-augmenting technologies remain competitively more productive – in different ways. Big data is a capital-augmenting technology that does not compete but is actually complementary to labour intensity. It may be defined as a pivot technology between capital-labour substitutability and complementarity: whereas the technology’s development relies on extended human input, its applications shall undoubtedly replace labour-intensive tasks such as economic forecasters or warehouse clerks. It is a technology, not innovation. Concurrently, self-driving vehicles are currently put off by the abundance of labour-augmenting technologies in the form of platforms that distribute work. This is plausible as capital and labour in the US remain complementary. Going forward, the trend for more intense work diminishes returns. To a firm in a competitive labour market, labour presents diminishing returns as higher human capital requires higher wages constrained by regulatory requirements to effort intensity. That is, a more able engineer may be unable to work longer while earning more. 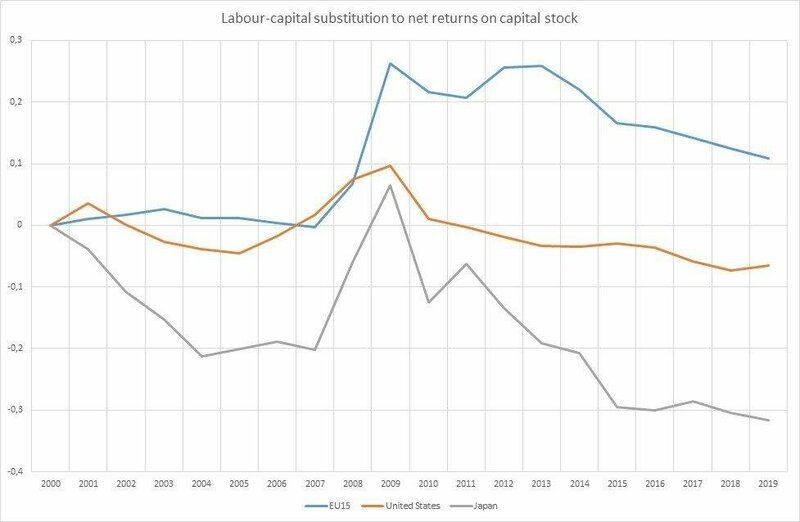 Labour only displays increasing returns when complemented with capital (defined by Romer, freshwater economist, as knowledge – without distinguishing between labour- and capital-augmenting technologies), itself exhibiting increasing returns. Labour’s diminishing (perhaps constant) returns implies the current job-based recovery has resulted in increasing nominal and real wages as the labour share measured in nominal terms increased. A diminishing labour share in real terms (with such a gap between light blue and green plots) is explained differently by Keynesian saltwater and Sargent freshwater economists. Saltwater economists would perhaps argue that public stimulus increased demand and productivity, and tightened the labour market leading to higher inflation. Freshwater economists consider economic agents anticipated inflation and thus reacted to public stimulus by increasing wages and prices without a real effect on productivity. 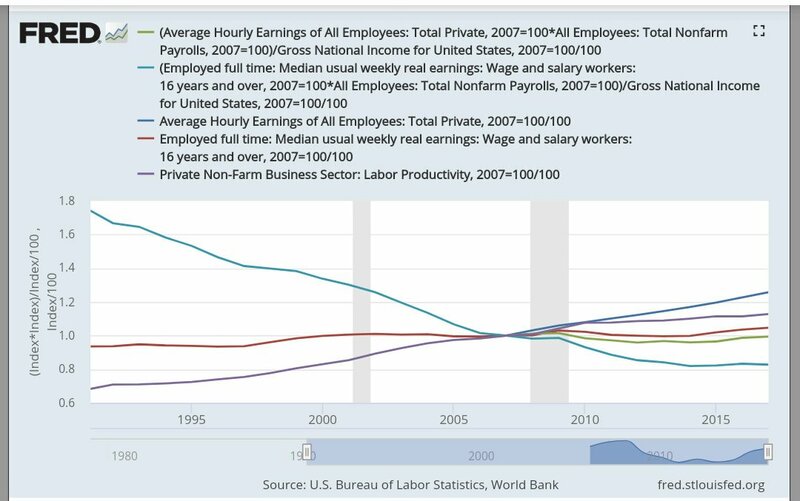 the increasing gap between nominal wages and the purple plot, labour productivity, does not falsify freshwater’s perspective nor the observation that a (diminishing returns) labour intensive recovery does not increase productivity. Structurally, it suggests that a recovery reliant on labour strength is inflationary not via demand but via supply-side effects as Janet Yellen so accurately explains: firms compensate higher labour costs resulting from lower productivity by increasing prices. 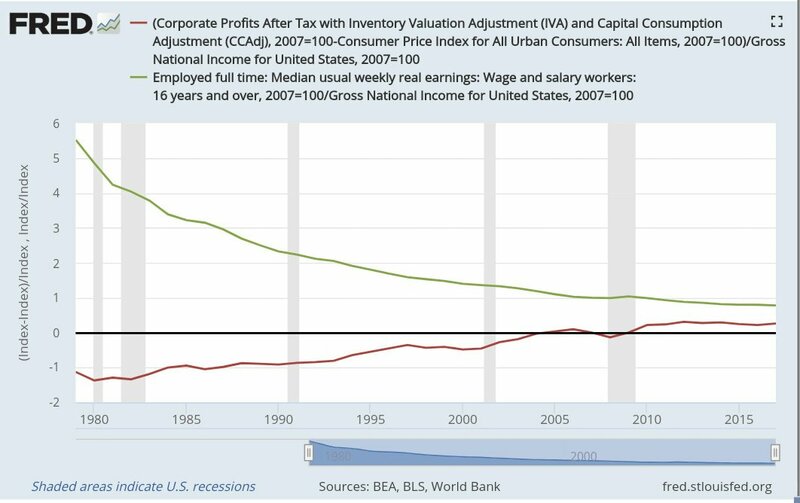 Going forward, the narrowing gap between the value of capital- (purple) and labour-augmenting (blue) technologies (plotted above) in real terms implies firms shall find comparatively less profitable to invest in capital – as long as interest rates remain subdued. Notice the gap was narrowest in the year preceding interest rate increases. 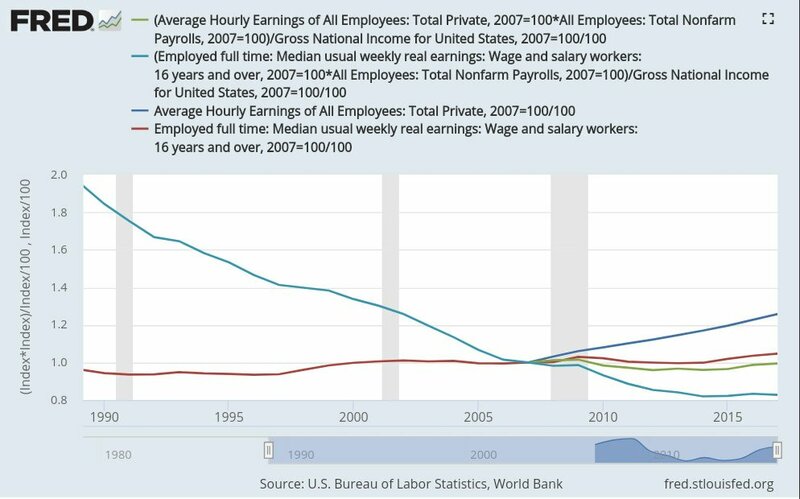 Yet interest rates are bound to increase as the diminishing returns of labour increases wages that firms pass through to prices, increasing inflation and diminishing capital available for investment. As firms find increasing costs of capital, investment in capital-augmenting technologies is also bound to increase. 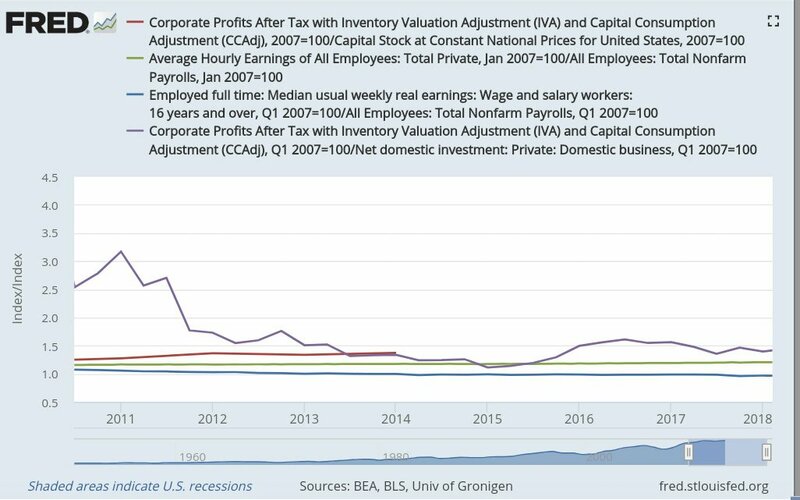 The dipping labour share and slowly increasing capital share signifies that capital is yet below the level when it is equally profitable to invest in labour- or capital-augmenting technologies in the US. Considering labour-capital complementarity, labour-augmenting technologies (such as the gig economy) should continue garnering firm preferences in the short-term. As previously suggested, government should foster existing capital-augmenting technologies’ depreciation (in the linked post I suggest the same for Europe but on labour-augmenting technologies,, considering the final chart of this post) and encourage take-up of big data and self-driving vehicles to accelerate capital-augmenting technologies and the build-up of firm capital. It would foster (2000, p.13, case 2, see also 2003 and NBER) natural interest rate increases until capital-augmenting technologies plateau and labour-augmenting technologies take-up. We could infer that it is too early for labour-augmenting technologies such as the gig economy to be profitable in the medium-term. The circumstance in Europe is, as we may see below, quite different. Previous Article Could tariffs on steel cause inflation?